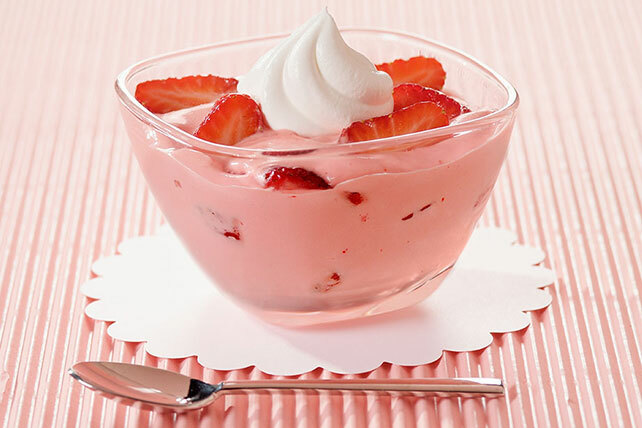 Sweeten your day with JELL-O® Strawberry Mousse Cups! Our creamy JELL-O® Strawberry Mousse Cups can be prepared using a variety of fresh seasonal berries. Add boiling water to gelatin mix in large serving bowl; stir 2 min. until completely dissolved. Add ice; stir until completely melted. Gently stir in 1-1/2 cups each COOL WHIP and berries until well blended. Spoon into dessert dishes. Refrigerate 2 hours or until firm. Top with remaining COOL WHIP and berries just before serving. Prepare using other seasonal fresh berries, such as blueberries, raspberries or a mixture of berries. Prepare gelatin mixture as directed, but do not stir in strawberries. Spoon 1-1/2 cups of the strawberries evenly into 6 dessert dishes; top with gelatin mixture. Refrigerate 2 hours or until firm. Top with remaining COOL WHIP and berries just before serving.